Do you know that the largest number of hair follicles present is on your forehead? Are you aware that hair covers most of your body? It’s common on the upper lip, cheeks, chin, legs, and feet. And yes, most of these hairs are not visible with naked eye, because they are delicate and pale. Many causes including genetics, certain medications, and the altered hormone levels, cause thick hair to appear in areas that you don’t like or expect. e.g., on the face, abdomen, neck, arms, breasts, underarms, legs, etc. What do you lose due to this? Self-confidence? Costumes of your choice such as a short skirt or sleeveless tees? It may also deter some from attending social gatherings or deter from going to a swimming pool or getting a life partner. And while you might not know the answer yet, you’re sure of one thing – you have unwanted hair on the face and body, that you want to get rid off. There are several ways to remove unwanted hair in India, from old-school methods like shaving, waxing, electrolysis, to laser hair removal, with results from temporary to near permanent hair removal of the unwanted fluff. With most of the methods, at least some of the hair will eventually grow back. Shaving is best for legs, arm, and facial hair. It can, though, cause ingrown hairs, especially in the pubic region. It is not a good method for removal of facial hair. Plucking or tweezing is really painful, but it may be a good option if you only have a few hairs that you want to remove. It is effective in removing stray eyebrow hairs or pulling out a few stray hairs that appear on your face. You should not, however, use this hair removal method for large areas. It can cause ingrown hairs or scarring. Hair removal creams, also known as depilatory creams. It is a strong and alkaline based product and is applied on the unwanted hair. Depilatory means “removing the hair”. Once applied on hair, it processes hair into a jelly-like substance. The chemicals often used in the cream can include sodium thioglycolate, calcium thioglycolate, and strontium sulfide to break down the protein bonds of the hair. Depending on the thickness of hair and cream’s formula, the depilatory hair removal process takes about 10 minutes to work. Thicker hair takes longer to break down than finer hairs. Using a cream improperly — for instance, leaving it on too long — can burn your skin. Such creams contain strong chemicals and the results are short-lived. Waxing: Waxing, as the name suggests, uses wax to pull out hair. Hot waxing can be messy and painful and may leave some hairs behind because they can break off. If the wax is too hot, you may get a burn. It is a semi-permanent way to remove hair from the root, taking anywhere from 2 weeks to 6 weeks for hair to grow back. It is one of the longest-lasting methods and it is quite effective on dark hair. Lasers are useful for removing unwanted hair from the face, leg, arm, underarm, bikini line, and other areas. Lasers emit energy in the form of photons which is delivered as a highly concentrated beam. It heats up hair follicles selectively and damage them. Laser light is attracted to and absorbed by melanin, the pigment in the hair.. The heat travels down the hair and destroys the root and interconnectors connecting it to the blood supply; preventing the growth of more hair. Only specific structures of the hair and follicle are affected, leaving the surrounding tissue undamaged. It generally requires 5-6 or more treatment sessions at 4-6 weeks intervals to bring about the hair reduction.Subsequent sessions are spaced depending on the hair growth. Depending on each patient’s hormonal levels and sensitivity the result varies and hence more sessions are required for those with polycystic ovary disease or other hormone abnormalities. We advise yearly touch up sessions for those patients to maintain the results of hair reduction. Before starting the treatment, we give each client a patch test with a 3 day waiting period to ensure skin is safe and patch test is successful. Increased selectivity, deeper dermal penetration. Lasers can selectively target dark, coarse hairs while leaving the surrounding skin undamaged. Faster treatment: Lasers can treat many hairs at the same time as each pulse of the laser takes a fraction of a second. Small areas such as the upper lip can be treated in less than a minute, and large areas, such as the back or legs, although may take up to an hour. Less optical energy. Enables use of light energy at a level that is safe for all skin types. Precisely targets areas “preheated” by optical energy and avoids cool areas. Poses no additional risk to the epidermis. Predictability. Most patients have permanent hair reduction after an average of six to eight sessions. Our clinic offers a full range of hair reduction treatments with the diode + radiofrequency (RF) machine, diode laser, and long pulsed NdYag laser. We assure you of a safe and effective way to get rid of unwanted hair from almost every body part, regardless of skin and hair type. Achieving beautiful, silky, smooth skin is now easier than ever with our newly introduced diode with RF machine. It is the fastest diode laser platform for the pain-free treatment of unwanted hairs. It delivers safe and efficient treatment on a wide variety of skin and hair types. 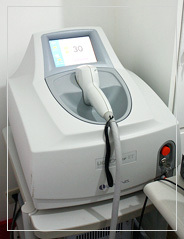 NdYag laser machine is also equally useful for the treatment of unwanted hair growth. Treatment for unwanted hair with this machine is tolerated well by all skin types. At our clinic, we also make use of Diode laser (810nm), the first laser approved by FDA (US) for permanent hair reduction. These lasers mainly focus on weakening melanin that results in permanent hair removal in that specific area. The latest Diode laser we have is of 400 ms pulse duration that is a tailored solution for Indian skin. Thes medical grade devices are available for use in India only by licensed dermatologists (skin doctors) and is available in our clinics throughout Kerala & Tamilnadu. We have more than 15 years of experience in this field. Shave off the body area: During the pre-treatment consultation, you may be advised to shave off the body area that will be treated.You will be advised not to wax, pluck or thread for the duration of your laser course. Medication: You may as well be advised to take oral antiviral medicines in some cases. Clean the body area to be treated. Leave it free of cosmetics, lotions, and creams. Please do not apply deodorant prior to the treatment session. Clothing: The treated area may have a soothing topical cream applied that you don’t want to get on clothing. Hence wear clothing that is loose fitting. Before the session, you’ll be given protective eye gear and, if you want it, a topical anesthetic. Once the session begins, you’ll feel a stinging sensation. You’ll know then that the laser is active. You may feel a pricking and burning sensation. But don’t worry; it isn’t bad at all. You will be advised to avoid direct sun exposure and to use sunscreens during the entire course of the treatment as it causes sun tanning . Just before the procedure, the laser parameters will be adjusted according to the color, thickness, and location of your hair being treated as well as your skin color. Depending on the laser or light source used, you will be required to wear appropriate eye protection. It will also be necessary to protect the outer layers of your skin with a cold gel. This will help the laser light penetrate the skin. Depending on the size of the body area treated, a laser hair removal session can last anywhere from a few minutes to a couple of hours. When the procedure is completed, you may be given ice packs, anti-inflammatory creams or lotions, or cold water to ease any discomfort. You may schedule your next treatment four to six weeks later. You’ll be advised to undergo follow up sessions to make sure unwanted hair stops growing. For a day or two afterward, the treated area of your skin will look and feel like it’s sunburned. Cool compresses and moisturizers may help. You can wear make up and use facewash/cleansers as usual unless your skin shows signs of burns like blisters or crusts. Remember that any medication or lifestyle changes including physical activity, sun exposure, may affect results. Make sure you report these changes to our nurse during the follow-up consultations. Enjoy the fact that you never have to worry about waxing, shaving and plucking unwanted hair ever again! The cost varies widely, depending on factors such as the area being treated, number of sessions required etc. If you are looking for permanent results you should consult a dermatologist and discuss laser hair reduction treatments and its costs. Is the hair reduction treatment right for me?? Laser hair reduction is a safe and effective solution for most skin types. Is the hair removal treatment painful? Not at all, the process is really simple, and painless. You will feel gentle flick against your skin each time the laser is activated, targeting the root hairs safely and effectively. Laser hair reduction is a quick lunchtime process. When can I expect to see results after treatment? Nature and rate of hair growth vary from individual to individual depending upon a few factors including age, weight, metabolism rate, hormone levels, ethnicity, medications taken, climatic exposure, etc. Laser hair reduction is most effective when the hair is in Anagen phase (At any given time, the majority of our hairs is in Anagen phase). At this time the melanin content of hair is abundant. One treatment may not be enough, and for most of the people, six sessions or more are needed. For those with hormonal imbalances, the desired result can be obtained only after a series of treatments. An endocrinologist may help in solving the hormone related issues. Why do I need to undergo a series of treatment sessions? Please understand the fact that laser only works on hair that is in the growth phase of the hair cycle, called Anagen. The other two phases of the hair cycle, called Catagen and Telogen, mean the hair is withered dormant or falling out; so laser doesn’t impact it. As all of your hair is in different phases at different times, you need several treatments spread out over a number of weeks to ensure the laser ‘catches’ the each of the hairs in their growth phase at some point. It depends on the area being treated; how thick and dense the hair is and your skin type – it varies from person to person. You’ll need at least 3 to 6 treatments and it will also depend on how often you come back for your treatment sessions. Coarse, thick hair such as that on a man’s chest will take longer to treat than fine hair, but your initial consultation with an experienced therapist will give you an idea of what to expect. It only affects the specific structures of the hair and follicle, leaving the surrounding tissue undamaged. Side effects from laser treatment are usually minor e.g., redness, swelling, and burning may occur, which usually subside after a few hours. Visit or write to our Dermatologist near you and see how they can help you with laser hair removal and live up to your wish. We provide the best hair removal treatment in Kerala & Tamil Nadu.